There’s nothing quite like gardening. The smell of freshly tilled soil evokes images of plump ripe tomatoes and a dinner table full of homegrown vegetables that taste better than any you can buy at the supermarket. If you’re already a gardener, you most likely understand the need to fertilize the soil to increase the yield of vegetables and fruits. Rest assured, fertilizing a garden does not have to be an expensive proposition. You can turn your kitchen scraps into compost, which is a natural fertilizer than can be made without spending a dime. All you need is a place to make a pile of unused plant parts. A compost pile is typically about three feet wide by three feet long. Keep in mind that you will need space on which you can turn the pile over because aeration is an important part of the composting process. There are many gardening aids available to help speed up the composting process. A wide variety of kitchen waste processors are available. There are commercial plastic boxes with lids that hold the plant waste. Some folks opt to build their own three-sided structure using wooden boards and wire mesh to hold the plant waste while it decays into organic fertilizer. Most types of composting units are stationary. 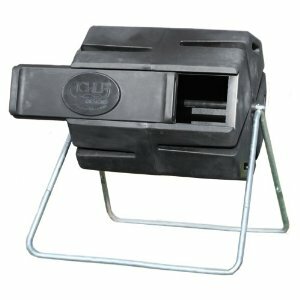 However, there is a compact unit available that takes the mess and fuss out of making compost. The Achla CMP-05 Spinning Horizontal Composter eliminates the need for turning the compost pile by hand. Simply spin the drum with a touch of a finger and you’ll have plenty of natural fertilizer to boost plant growth in the garden or the greenhouse. Next post: Can Asparagus Cure Cancer?